The crowds keep coming to Santorini! Is it for the striking sunsets, the red and black beaches and impressive cliffs of different colors, the Cycladic blue and white villages or the fantastic food and wine? 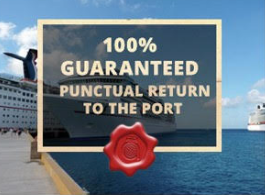 Truth is, Santorini is the most idealistic of the Greek Islands to visit for all of the above! 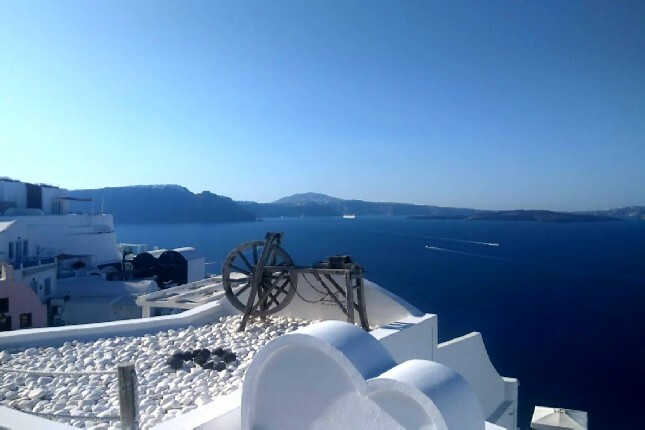 So, whatever your preference, The Travel Insiders’ Santorini Island tours cover all the best of what there is to see and do on Santorini Island, in Greece. Atop a steep cliff and far from the island’s red and black beaches stands the town of Fira, the capital of the Greek Aegean island of Santorini. Fira’s assemblage of extravagant shops, whizzing mopeds and curious tourists make the town of Fira the most bustling spot on the island. Visitors from all corners of the earth who wonder what to do in Santorini can find anything they crave for, from elegant restaurants to trendy cafés, fearlessly peering over the edge of town. 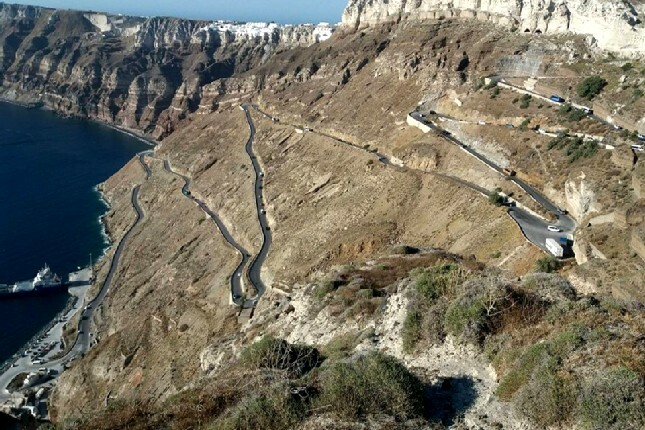 No one can deny the pleasure of wandering through the cobbled streets and arriving at one of the most beautiful natural sights in the world – the Santorini Caldera! The seascapes on our Santorini Island tours will literally take your breath away! 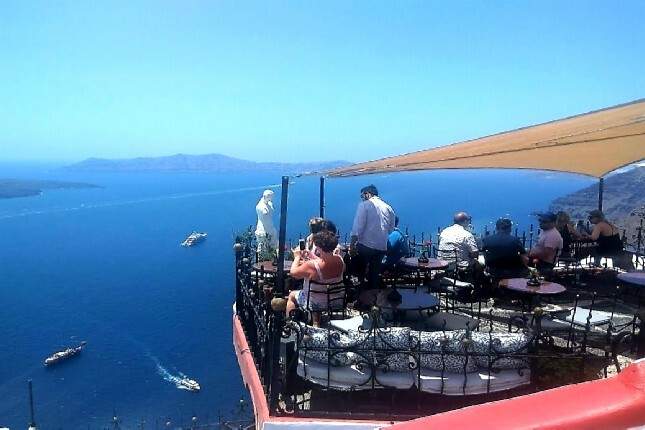 If you are on an afternoon The Highlights of Santorini – The Black Pearl of the Aegean tour, you may even watch the Santorini sunset from Fira cliffs, accompanied by a drink or a snack with pleasing music in the background! Where is the Best Place to Watch the Sunset in Santorini? 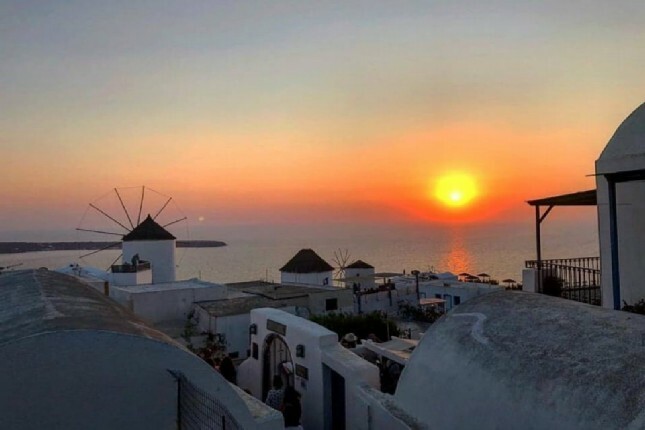 Just about everyone visiting this island of the Cyclades will ask, “Where is the best place to watch the sunset in Santorini?” The breathtaking sunsets from Oia have made the Cyclades famous and have put Santorini Island tours on just about everyone’s bucket list! 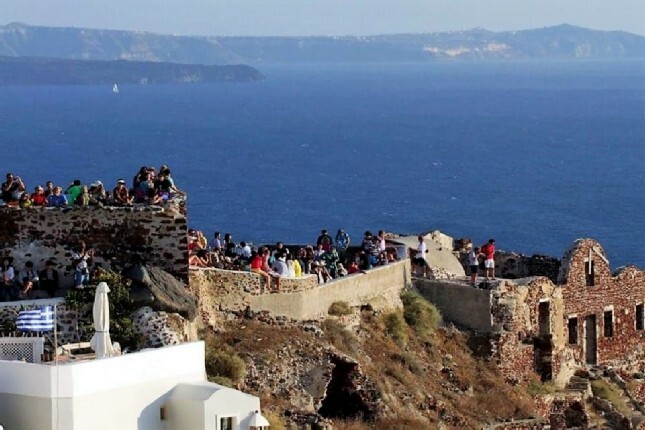 So, when on your Santorini Bucket List Tour in Breathtaking Oia, head for the cliffs and secure a prime Oia sunset view before camera-happy crowds fill the western perches of the town. 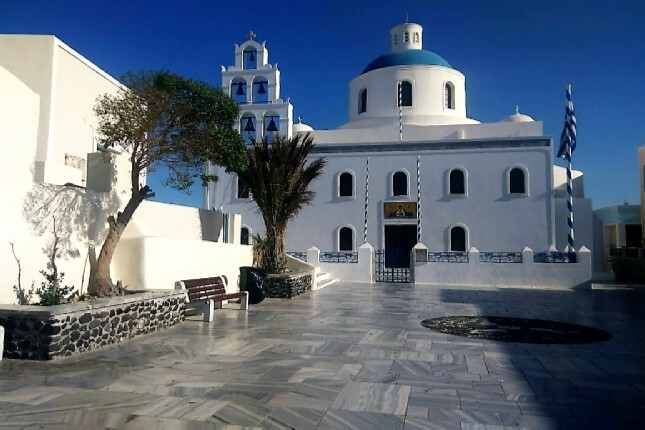 What to See in the Village of Pyrgos in Santorini? Traveling up the lofty hillside, one may question what to see in the village of Pyrgos in Santorini. Discover the picturesque little coffeeshops and the relaxed pace of life of the villagers that seem to have remained untouched by the tourist industry and undisturbed by the various Santorini Island tours. A short drive up the mountain then leads to the Monastery of Profitis Ilias. Built in 1711, the original monastery opens solely for formal liturgies. Here, the strict dress code requires covered arms and legs. A small newer church stands in the shadows of its imposing predecessor’s looming bell towers, with a small chapel and garden, offering a bird’s-eye view of the island while providing shelter from the mountaintops’ gusty breezes. Is the Archaeological Site of Akrotiri the Lost City of Atlantis? 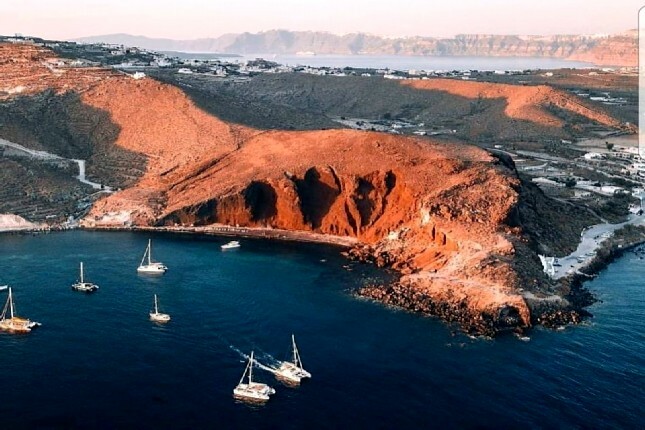 Santorini Island was an outpost of Minoan society from 2000 BC until the beginning of the 17th century BC, when a volcanic eruption blanketed the island with lava. This disaster gave Akrotiri a Pompeii-like immortality, preserving the site almost completely. 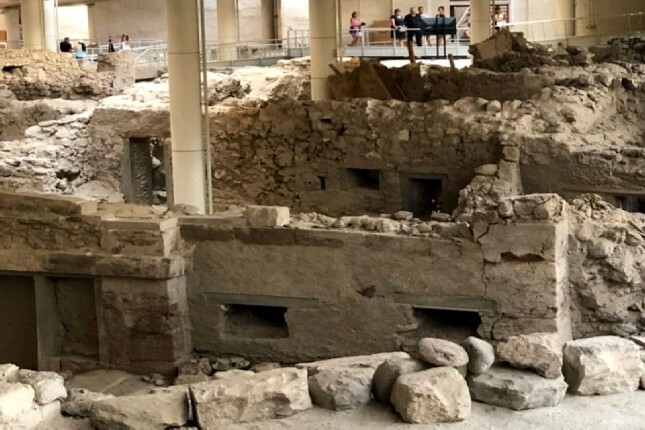 The excavated multi-storied houses and remains of sanitary, drainage and sewage systems confirm the sophistication of Minoan society, believed by many to be the Lost City of Atlantis. At least one wall in each house was decorated with fresco. These earliest large-scale examples of art form have greatly contributed to present-day knowledge of Aegean art and culture. 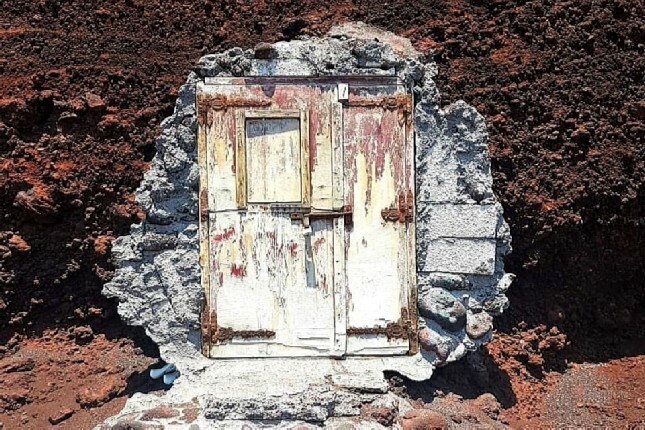 Wander through the streets and squares of the ancient town on your Akrotiri Excavations - Red Beach & Oia - The Splendor of Santorini tour and discover for yourself - is the Archaeological Site of Akrotiri the Lost City of Atlantis? Which is the Best Beach in Santorini? 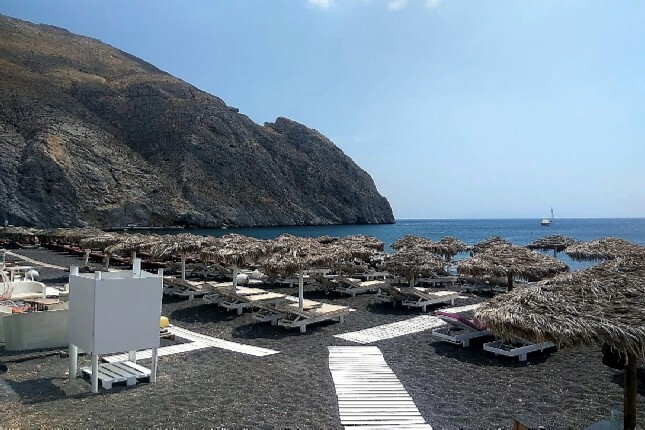 Which is the best beach in Santorini – red, black or white? Santorini offers some of the most unique beaches in the Cyclades with red, black, white sand beaches and deep blue waters. 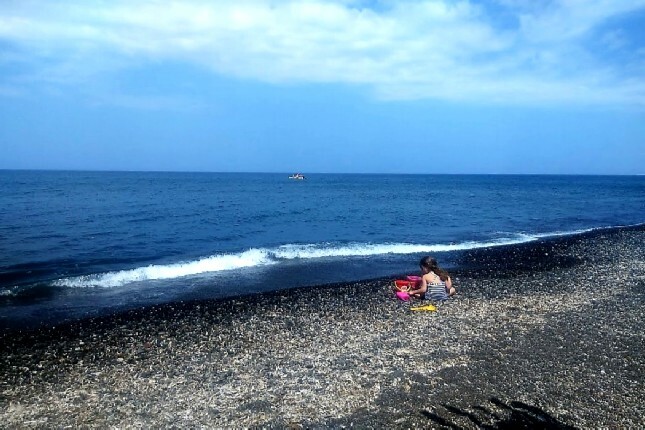 Located near the Archaeological Site of Akrotiri is the scenic Red Beach. The Red Beach’s remote location, rare reddish sand and stony-red cliffs make it unique in the whole world. Near the Red Beach, you can find the extraordinary White Beach. 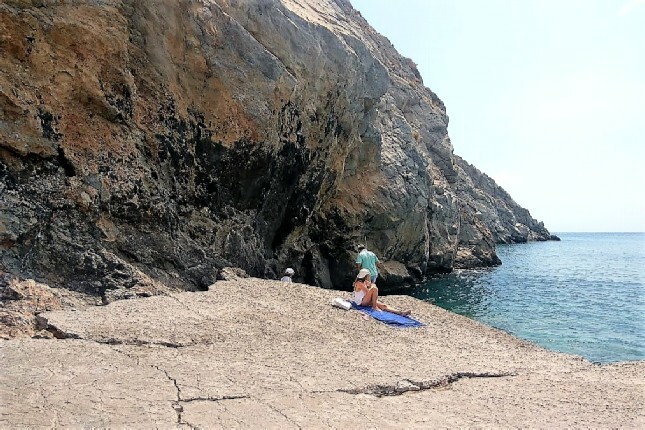 This small isolated cove is white pebbled and surrounded by white towering cliffs. There are no facilities on this tiny beach apart from a few sunbeds and a small, cave canteen. 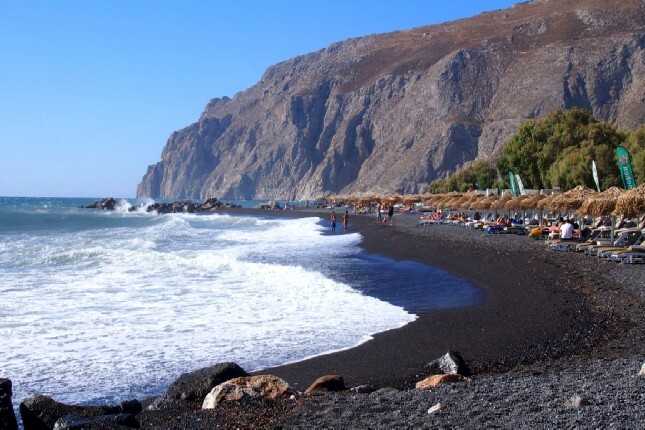 However, Santorini is renowned for its black beaches. 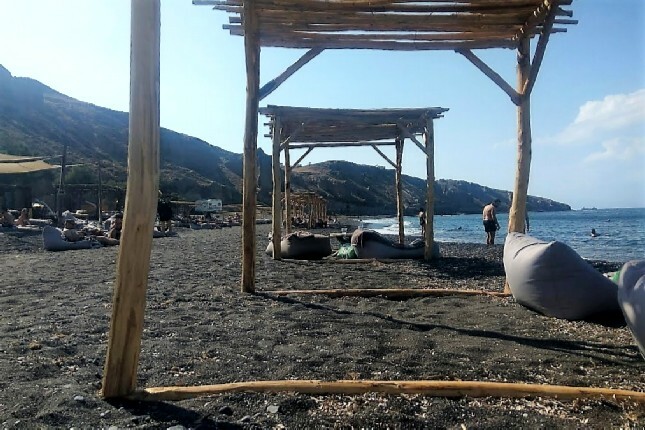 A stop for a refreshing dip or lunch at the renowned Black Beach of Kamari on The Highlights of Santorini – The Black Pearl of the Aegean tour is a must. It is arguably one of the most famous beaches in Santorini. 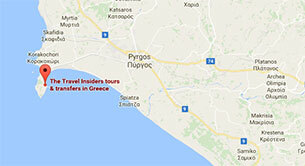 Which Winery to Visit in Santorini? Santorini has come to be one of the top wine destinations in Europe. 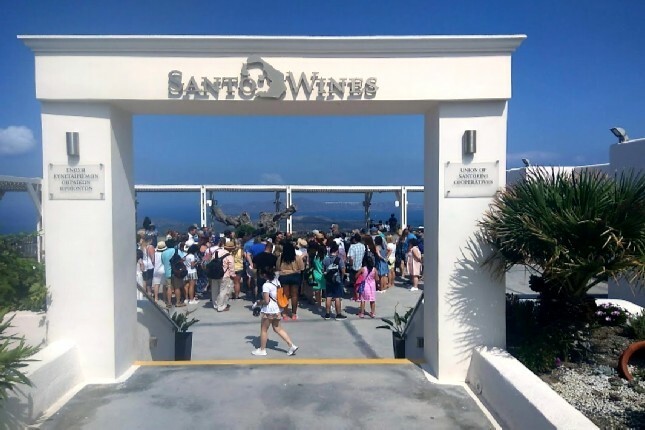 So, if you’re contemplating on which winery to visit in Santorini, take part in one of our Santorini Island tours, Santorini 5 Senses Wine Tour to 3 Awarded Wineries, and tingle your taste buds with a one-of-a-kind wine tasting experience! 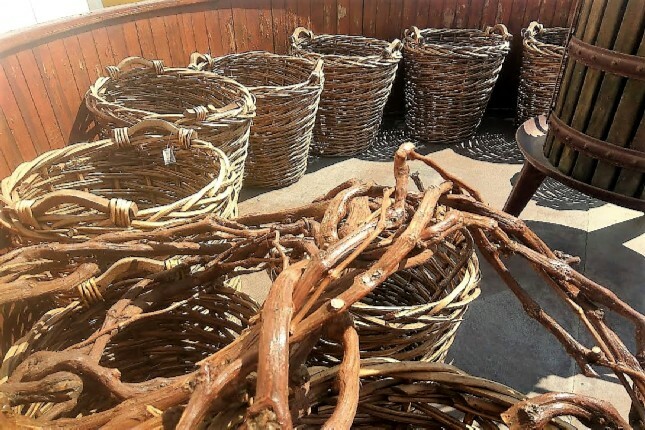 Visit an age-old vineyard and learn about the traditional wine-making process that goes back to ancient years. 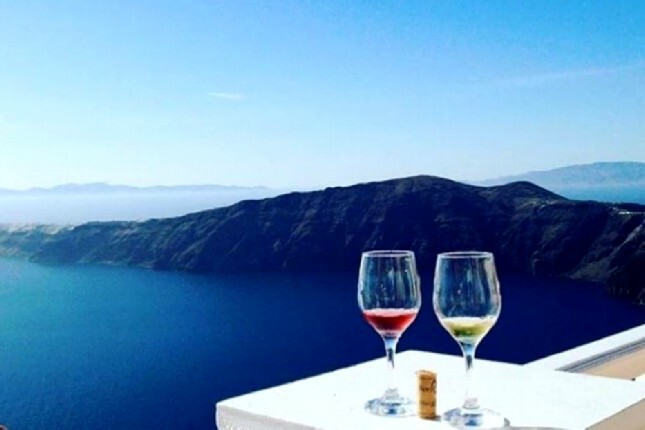 Discover all there is to know about the wine culture of the Cyclades and why the Santorini Island soil creates an interesting flavor difficult to find elsewhere. Santorini, also known as Thira, is one of Greece’s top destinations for holidaymakers. Its breathtaking views, picturesque villages of blue and white houses, unique beaches and fantastic food and wine place it top on the list of the Greek Islands. 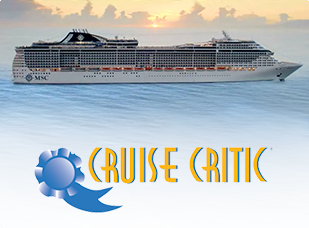 Book one of the Santorini Island tours and make your visit to the Cyclades a memorable one!